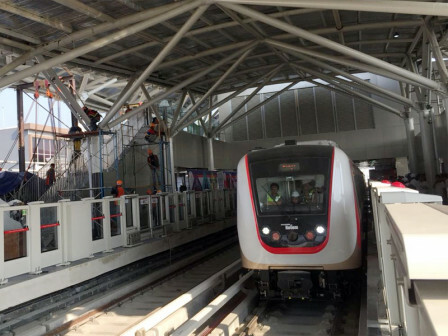 Through PT Light Rail Transit (LRT) Jakarta, the city-owned construction company PT Jakarta Propertindo (Jakpro) is conducting the first functional trial towards two trains, Wednesday (8/15).
" Today two trains are trialled with a distance of 5.8 kilometers, from Velodrome Station"
PT LRT Jakarta CEO, Allan Tandiono disclosed that it is conducted with a limited number of passengers, which are 100 people by traveling the Velodrome Station, Rawamangun, East Jakarta to the Boulevard Utara Station in Kelapa Gading Mall, North Jakarta. "Today two trains are trialed with a distance of 5.8 kilometers, from Velodrome Station, Rawamangun to Boulevard Utara Station, Kelapa Gading Mall," he stated, Wednesday (8/15). In its trial, the train is controlled by the machinists with a maximum speed of 40 kilometers per hour on a straight track and 25 kilometers per hour on a cornering track.